All contributions are peer-reviewed by an international Program Committee. Accepted papers, posters and demonstrations will be archived in the ACM digital library. Authors of selected papers will be invited to submit extended versions of their papers to a special issue of the ACM Transactions on Accessible Computing (TACCESS). 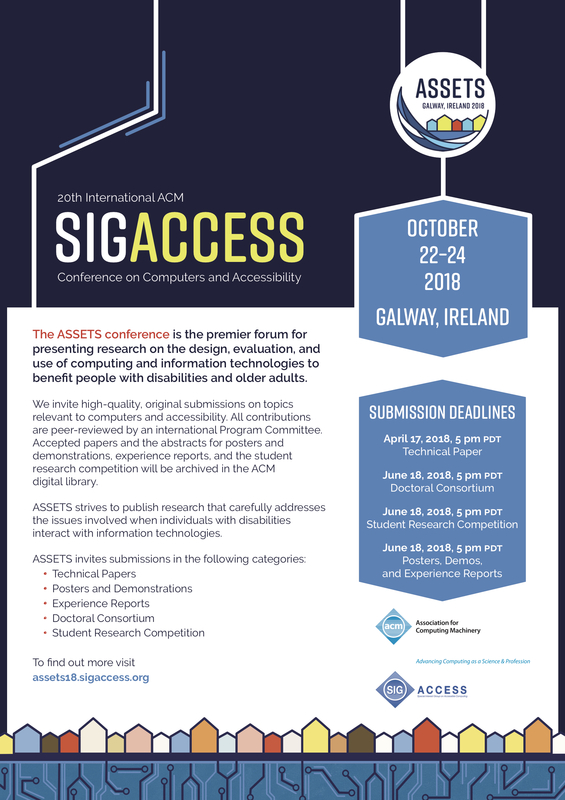 Please help the ASSETS community reach new people by displaying or distributing our conference flyer [pdf]. For more information about the venue check out the Venue page. For more information please visit the Call for Papers page. Please visit the Organizing Committee page to see the entire list. For more information on the different committees please visit the Committees page.